And here we thought that we'd only have to be petrified of Justin Bieber on the street, skateboard parks, clubs, and generally every other place you can walk on the Earth. Not so — we have the skies to worry about, too. On Wednesday, an official report from NBC News stated that Justin Bieber was "extremely abusive" toward the staff on a plane that he leased to fly from Canada to New Jersey on Friday for the Super Bowl. According to multiple sources from authorities, the Gulfstream IV private jet was carrying the 19-year-old singer, his father, Jeremy Bieber, and an entourage of 10 people. The plane was reportedly so full of marijuana smoke that the pilots had no other choice but to wear oxygen masks, and had to keep a flight attendant safe in the cockpit who was getting harassed by the group. The captain of the flight stated that he warned the passengers, including Bieber, on several occasions to stop smoking marijuana. The captain also stated he needed to request that the passengers stop their harassing behavior toward the flight attendant and after several warnings asked the flight attendant to stay with him near the cockpit to avoid any further abuse. The flight attendant stated the passengers, including Bieber and his father, Jeremy Bieber, were extremely abusive verbally and she would not work another flight with them. Even though the jet had a pressurized cabin, the pilots reportedly had to wear their oxygen masks so that they wouldn’t accidentally inhale marijuana, fail a drug test, and put their pilot's license in jeopardy. The aviation company and Customs officials declined to comment. If this report is true, treating pilots and flight attendants that way is truly disgusting, simply put. Egging your neighbors house is juvenile, and getting arrested is extremely careless. But when you're aggravating someone whose job it is to get you to your destination safely and putting their safety and job in danger instead is unsettling and unthinkable in so many ways — especially when one of your parents doesn't do anything to stop it. When the plane landed in the Teterboro airport in N.J., it was met by Customs and Border Protection police. Drug-sniffing dogs examined the plane, that reportedly reeked of marijuana. No unsmoked drugs were found on the plane — however, two empty bags that once had marijuana in them were found, but couldn't be linked to anyone on the plane. 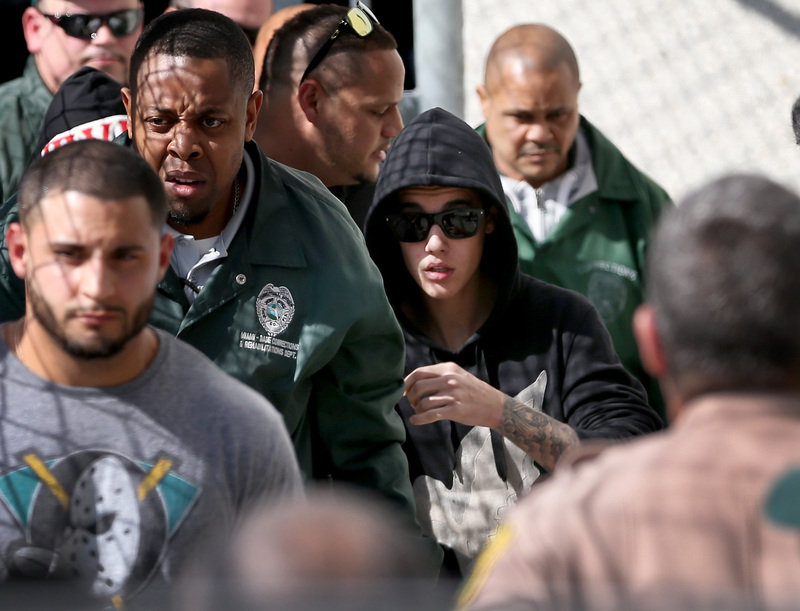 No members of the flight crew wanted to file charges against Bieber or his father, so they went on their merry way. If Bieber did that to me, I wouldn't want to waste a second more thinking about him or dealing with him, either. Like the flight staff, I would just never work with him again. You can always play devil's advocate for Justin (which I have) and say that perhaps his behavior is the result of living under a microscope and that he easily gets a bad rap because he's such a public persona. However, purposefully endangering the lives of others is never the effect of being famous at a young age — it's the result of forgetting how to treat other human beings. Let's hope he remembers how, and quickly — before it's too late.